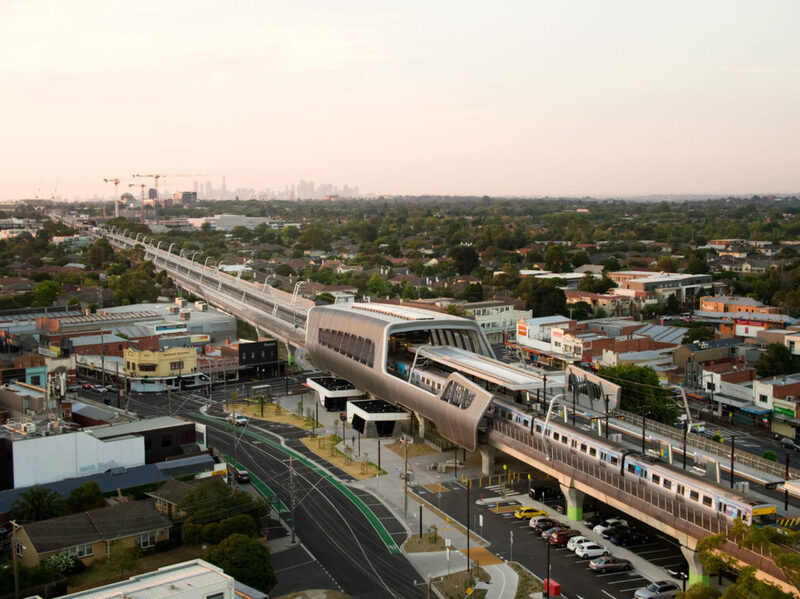 Melbourne is a growing and densifying city, entering a period of growth of above 6% and will eventually grow larger than Sydney. 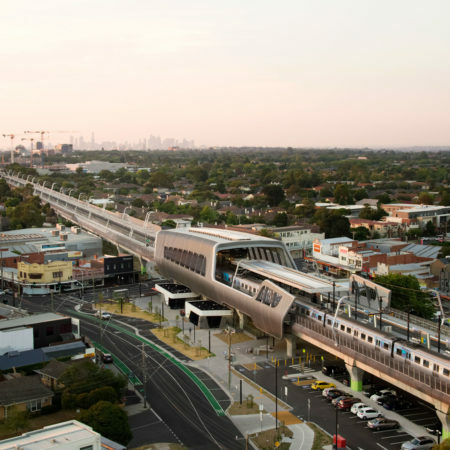 The city’s rail system has not been improved for some time and is now over capacity. 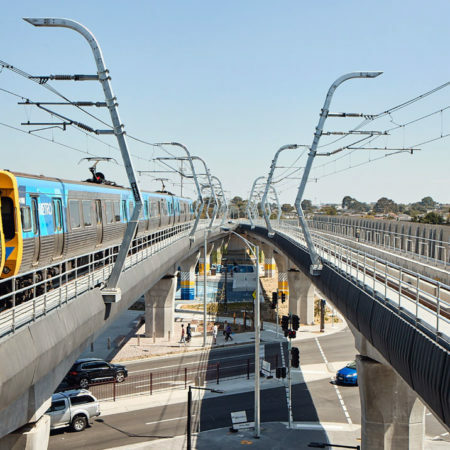 A few years ago, the government launched a program to remove level crossings between roads and railways and to extend the rail system and improve its capacity. 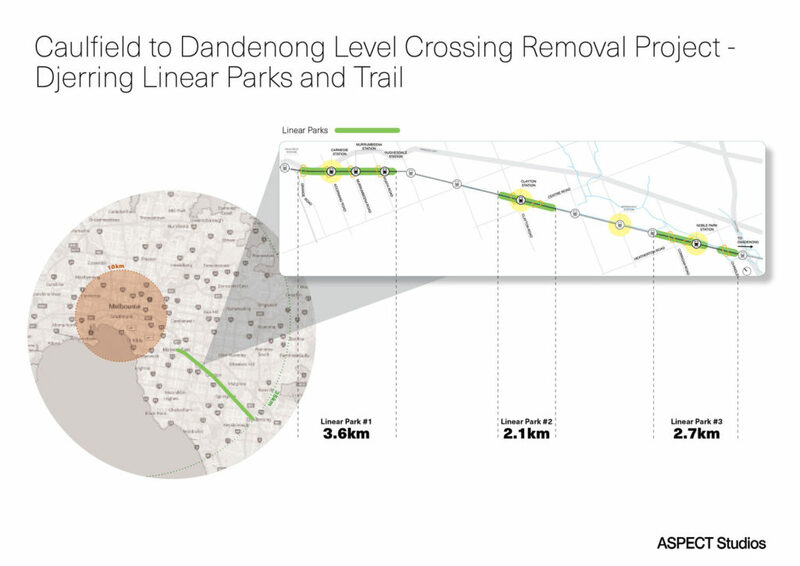 A key component of this program has been the Caulfield to Dandenong Level Crossing Removal Project. 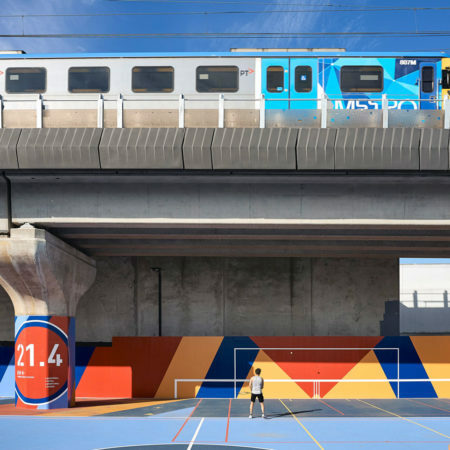 This is located on Melbourne’s busiest rail corridor and colloquially referred to within the industry as ‘Skyrail’ and the ‘the Underline’. 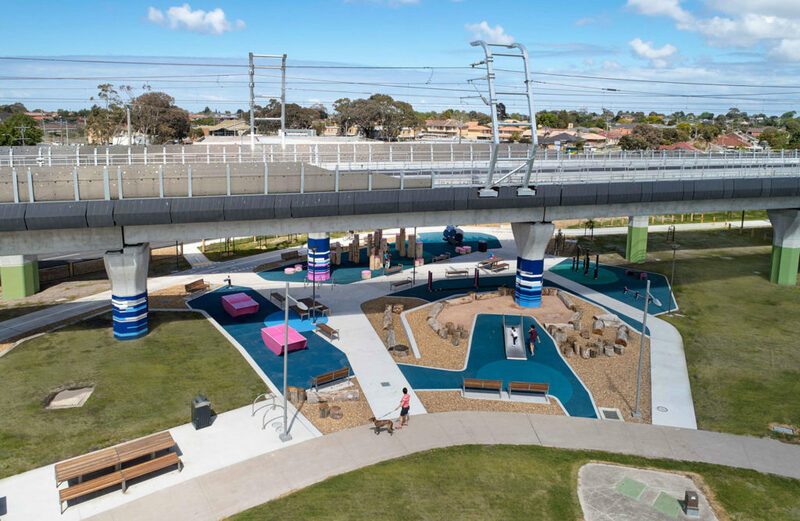 Five stations have been rebuilt, three sections of the railway line have been elevated, nine road crossings have been removed and 22 hectares of new public space created. 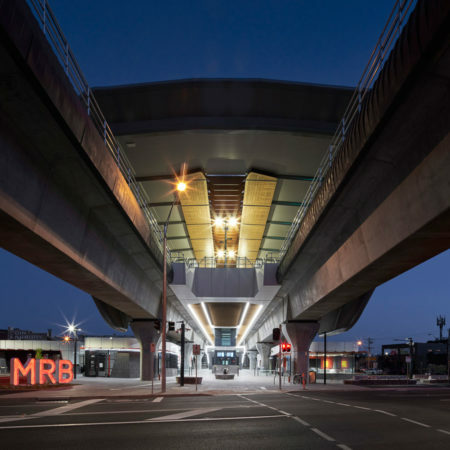 The project’s ambitious elevated viaduct-based rail solution sought to address several complex interlocking urban design issues and its impact has been far-reaching, extending well beyond immediate commuters and residents. 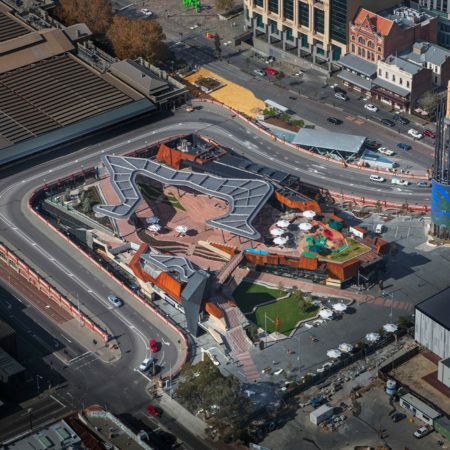 This significant infrastructure and urban design project, resulting from a collaboration between Cox Architecture and ASPECT Studios with the CTD Alliance team, has demonstrably shaped and delivered an engaging and participatory public realm, and rejuvenated established hubs located adjacent to the railway stations. 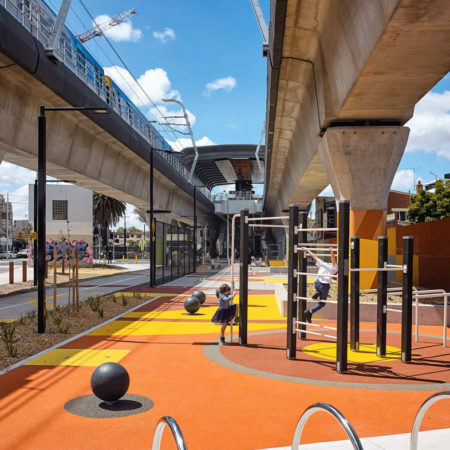 It highlights the true city shaping power of integrated transport and land use planning, demonstrating how rail corridors can be transformed to be vital social and structural elements of the city. 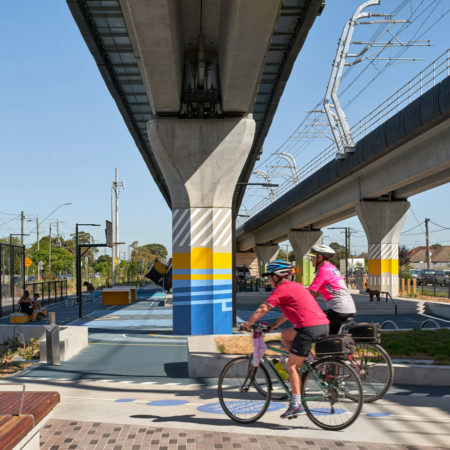 By elevating the existing rail line, not only have nine level crossings been removed, but a previously unavailable public realm has opened generating opportunities for community use and connection. 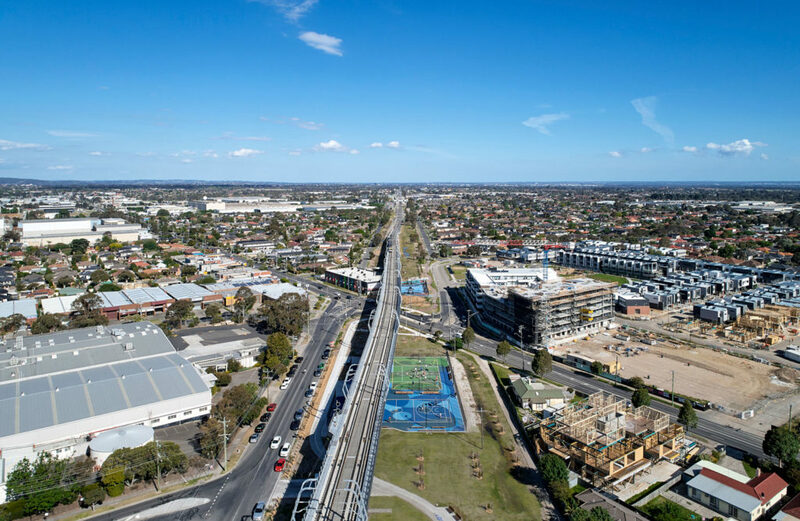 The project has delivered 22.5ha (more than 11 MCGs) of open space, parklands and new community areas, as well as 12km of newly-built pedestrian and cyclist paths. 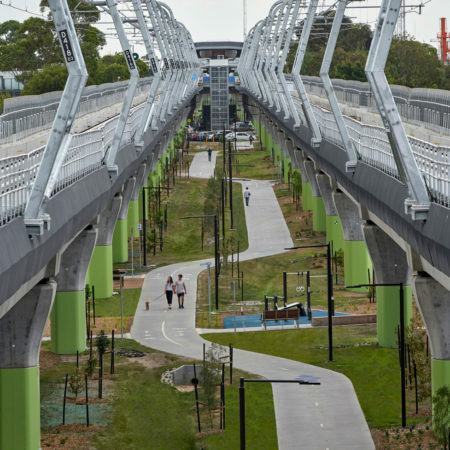 The three new linear parks each have a role and hierarchy in their neighbourhoods. 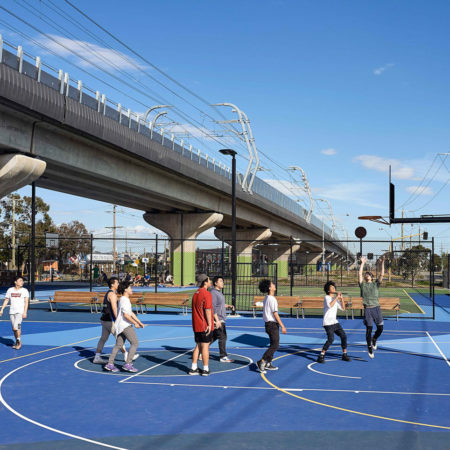 Caulfield to Hughesdale linear park – is now a primary park network for the City of Glen Eira, both delivering open space in a community with the lowest % open space per person in Victoria and creating new green links to existing parks. 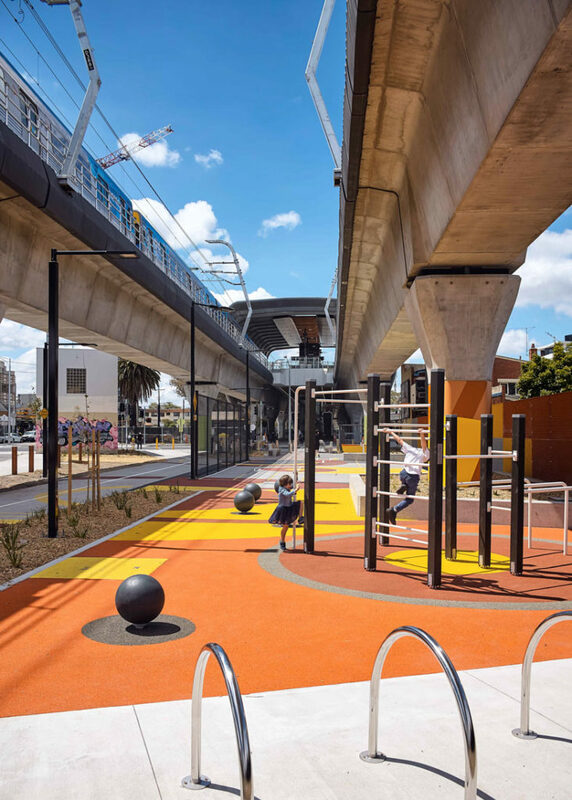 The Clayton linear park, creates public space within a burgeoning activity centre with no central civic or recreational open space for the community. 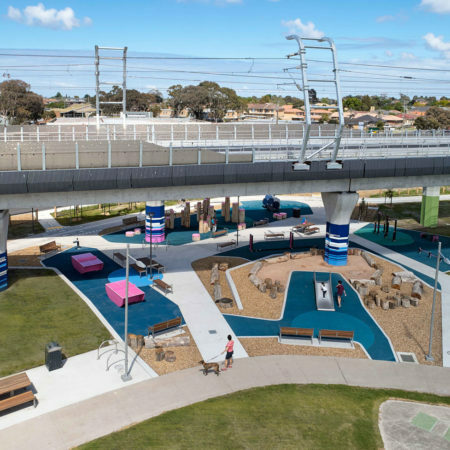 The Noble Park linear park is primarily an extension of an existing park that is augmented with activities that complement the existing facilities and programs. 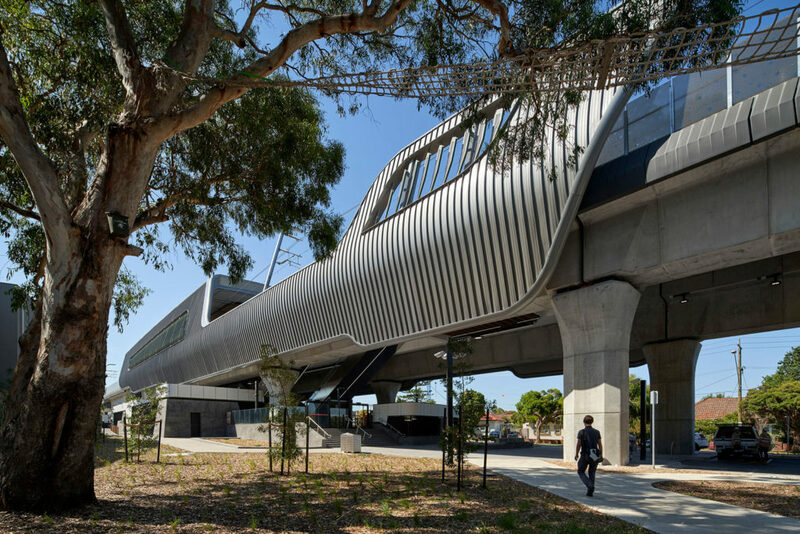 The station precincts were an opportunity to redevelop the civic centre of each community, with a cohesive architectural language uniting the stations and the public realm design being driven by local context. 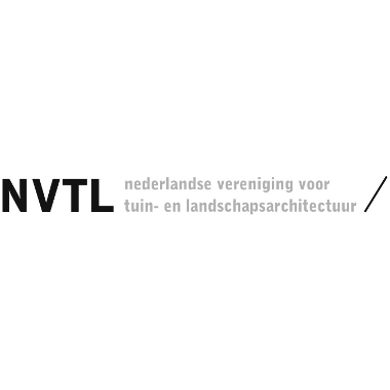 A new approach brings new challenges – dealing with the impacts of shade, visual intrusion, overlooking, water management, and the complexity of delivering a cohesive response which spans multiple local government areas and oversight authorities. 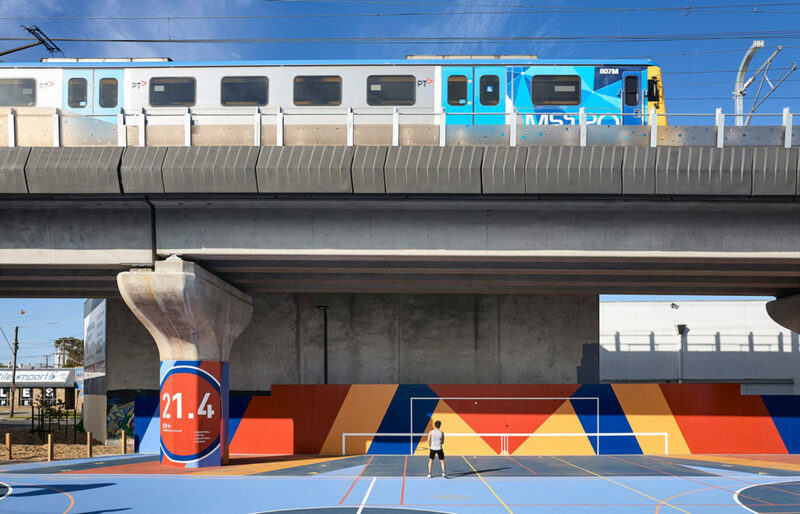 The project demanded a reimagining of what rail infrastructure looks like and how it functions, to depart from the old standards and approaches and develop new, more sympathetic responses. This was no place for cookie cutter solutions. 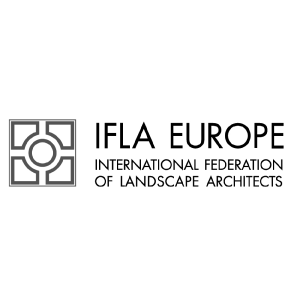 Extensive research, optioneering and advocacy was needed to find solutions to these challenges and obtain buy-in from stakeholders. 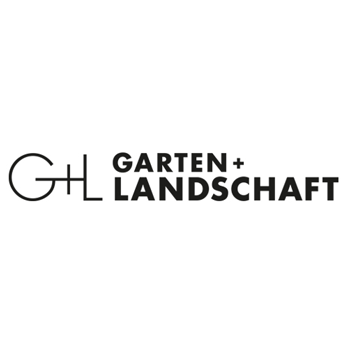 As the lead public realm consultants, ASPECT collaborated with Cox Architecture on urban design and John Rayner for horticultural. 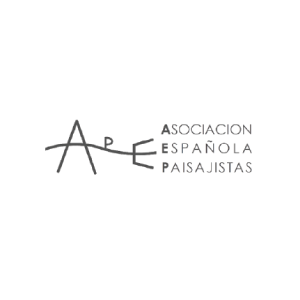 ASPECT’s role extended to be the lead wayfinding and interpretation consultant, collaborating with Double-A Communications for activation node graphics. 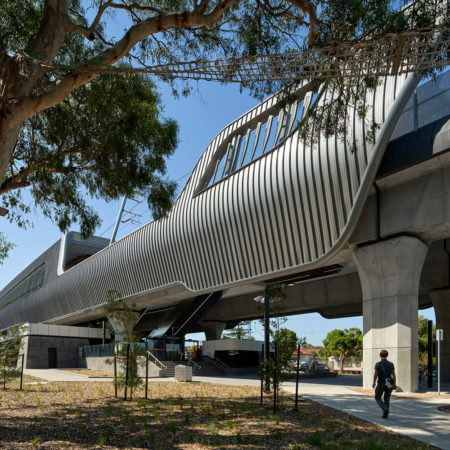 The breadth of ASPECT’s role provided a consistency and responsiveness to the complex design and delivery process which a project of this scale demands. 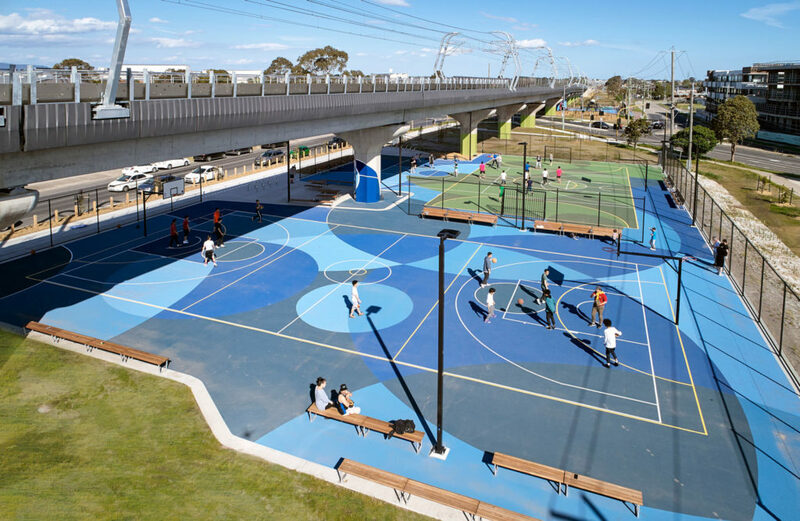 ASPECT’s collaboration extended beyond the immediate project team to the government Urban Design Advisory Panel (UDAP) and the Community Open Space Expert Panel (COSEP). 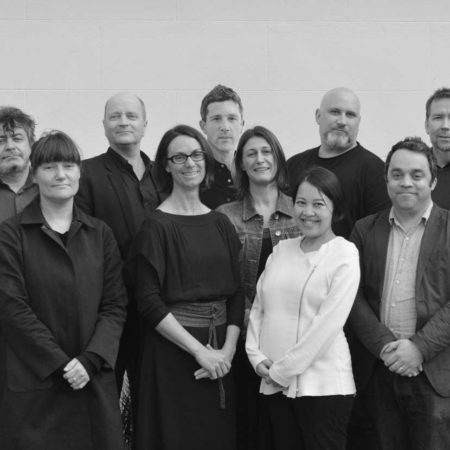 These forums were important vehicles in ensuring that community thinking moved from social media and over-the-fence conversations into real, constructive inputs which genuinely shaped the outcome. 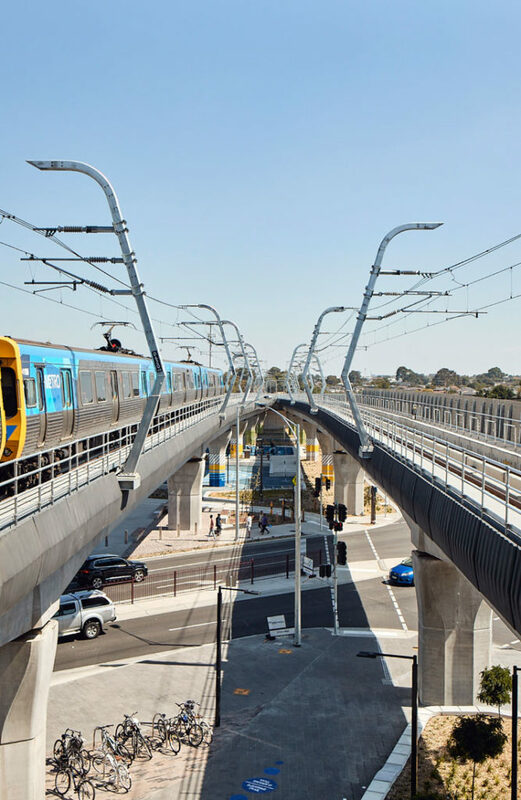 ASPECT engaged with the community and key stakeholders, to ensure that the outcome has unlocked the rail corridor to be more than a mere conduit for trains. 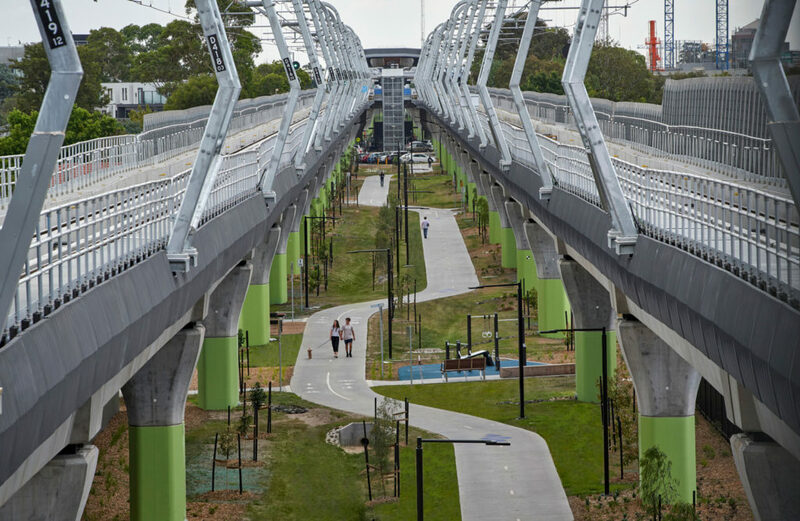 The rail viaduct was designed as a ‘split’ solution, separating the tracks to reduce the visual bulk and allow light and rainfall deep into the heart of the linear park below, to maximize a light-filled, inviting and safe ground-level area. 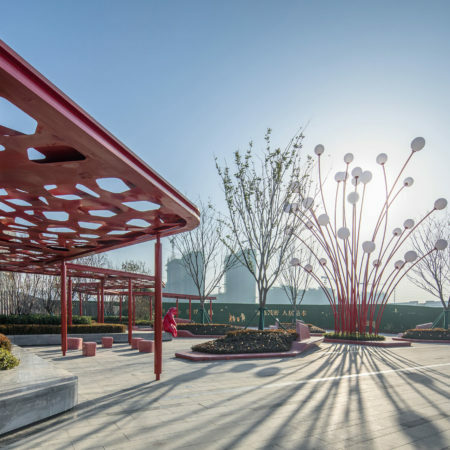 The concrete piers and capitals were sculpted to reduce their visual bulk and reflect their structural forces. 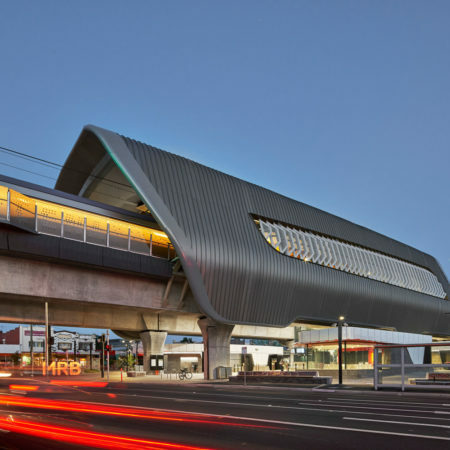 The sand-blasted acrylic screens have been designed to rise and fall within the eye-line of commuters as well as provide privacy in sensitive areas. 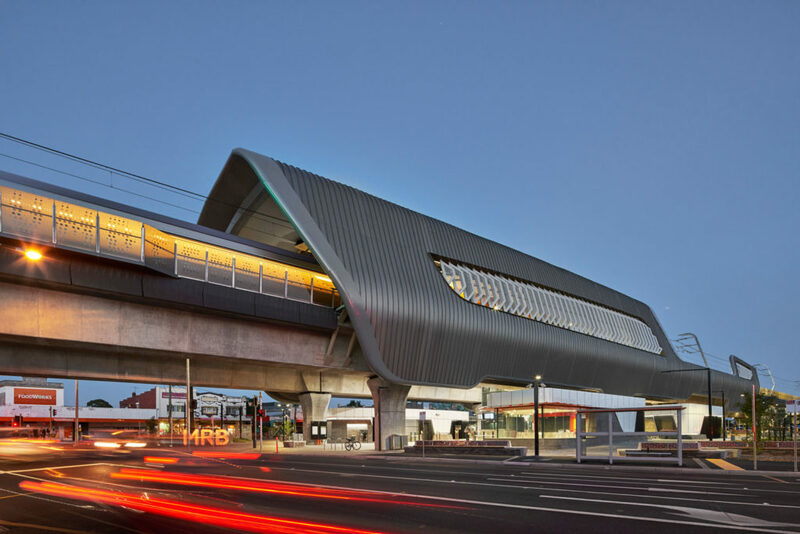 The five stations were conceived as bespoke community hubs, with each station including a new urban plaza and buildings at the ground level providing purposeful, pod-like structures reflecting their use and together forming the active edges of the ground level station concourse. 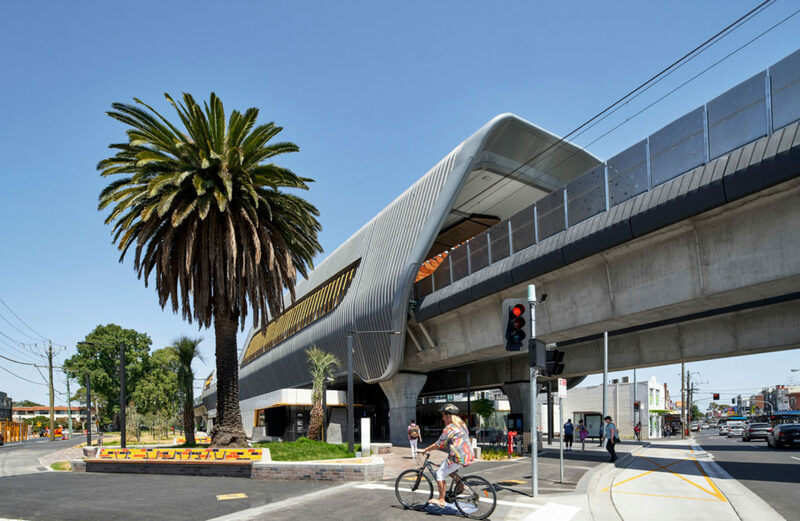 The stations have an elevated platform with a distinctive canopy which wraps the platform to provide superior weather protection whilst also framing views across the adjoining suburbs. 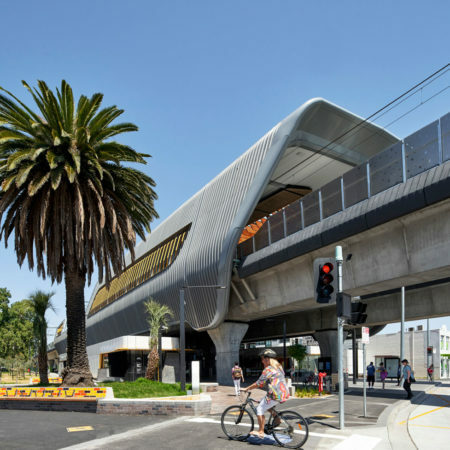 The plazas provide improved station access and connectivity to the adjacent neighbourhood and other transport modes such as bus, taxi, drop off and bicycle parking. 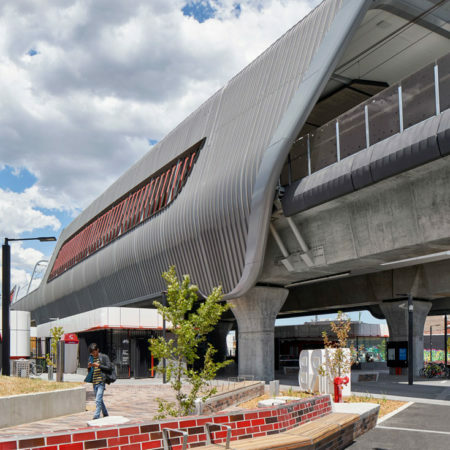 The material palette is natural with concrete, timber, zinc and steel; with coloured highlights that reflect each station’s precinct or suburban character. 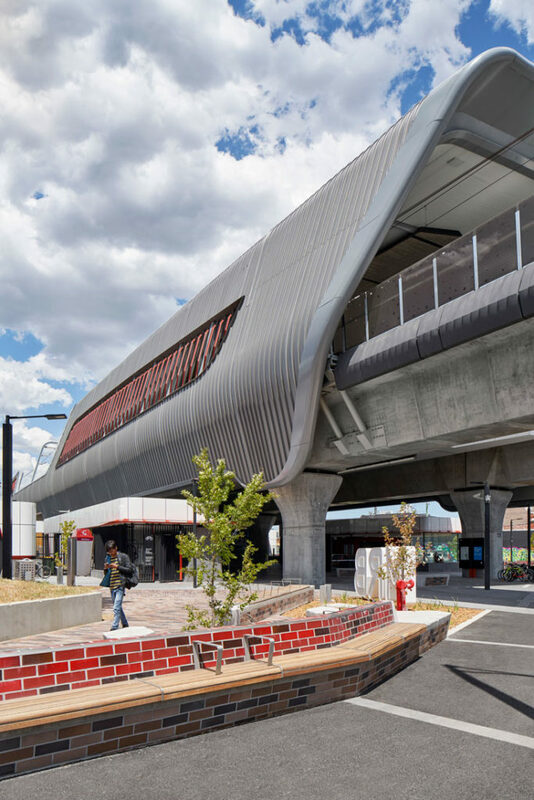 The bluestone paving of the public areas wrap up the station pod buildings, setting them into their context, and proving a robust response to day-to-day use. 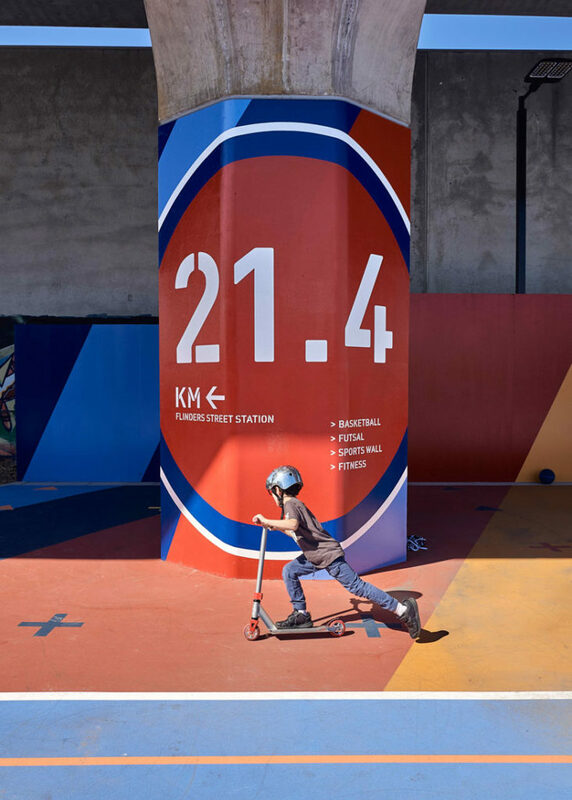 The station precincts deliver a legible and contextually grounded public realm, focused around an optimised multi-modal transport hub including interchanges for buses, trains and vehicles, as well as encouraging active transport (walking and cycling). 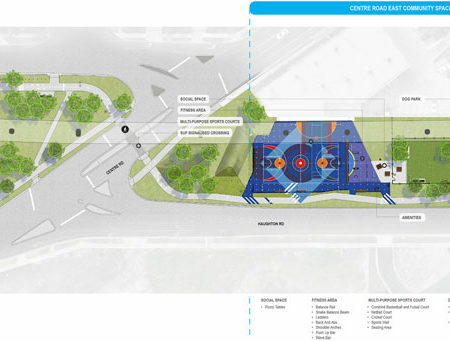 Each precinct has a plaza addressing the existing village, with the station’s forecourt entry given consideration as a key component of the community experience. 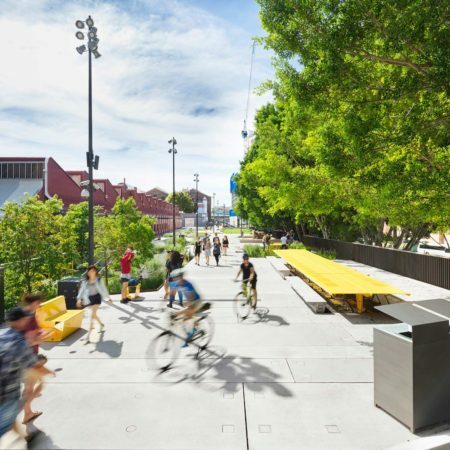 Key heritage trees and palms where protected and incorporated into the new station forecourts and town squares. 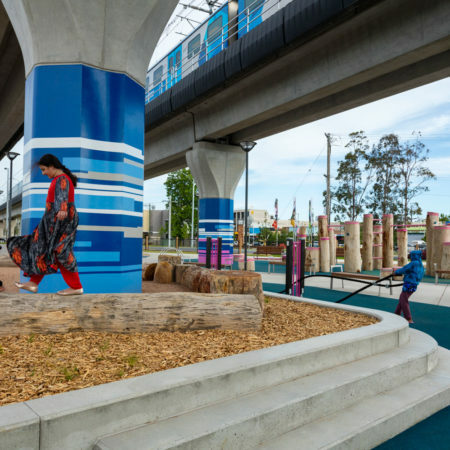 The linear parks feature neighbourhood, local and community ‘activation nodes’. 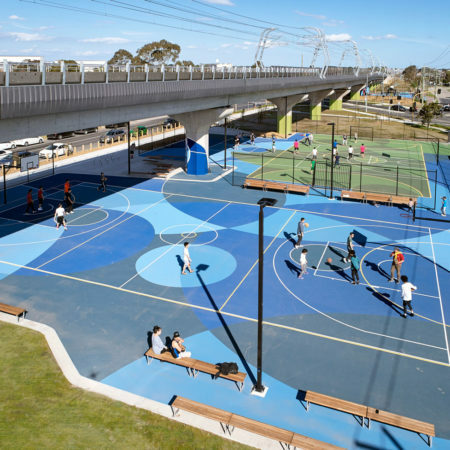 Ranging from small areas for local gatherings, with fitness stations, seating and planting, to playgrounds, picnic areas, dog parks and larger community areas for activities such as sport, skating and climbing, these nodes provide attractive, safe and well-maintained places for the community to enjoy. 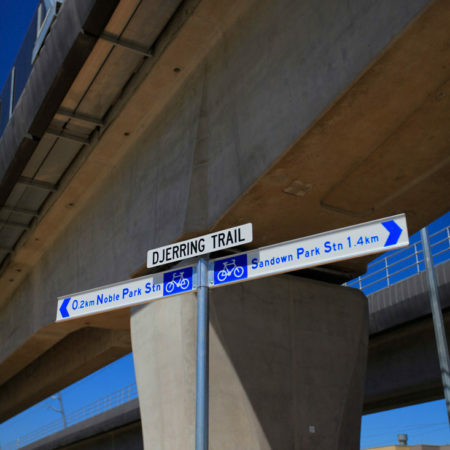 Over 4,200 trees are re-established in addition to those trees saved through the elevation of the rail line. Stormwater from the elevated viaduct is captured and discharged into the landscape at the base of the piers, from where it is conveyed through surface swales along the alignment to infiltrate through the soil profile and provide passive irrigation to tree planting and mitigate the impacts of the overhead structure on access to natural rainfall. 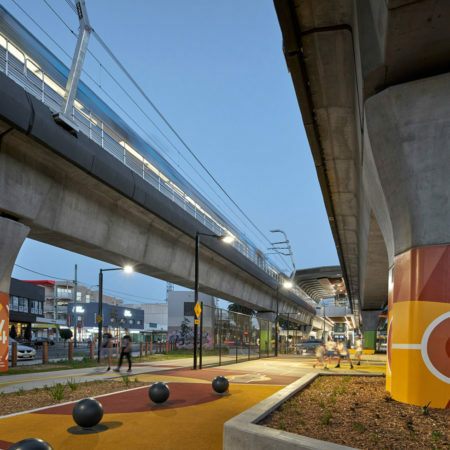 The project has created diverse and plentiful public spaces. 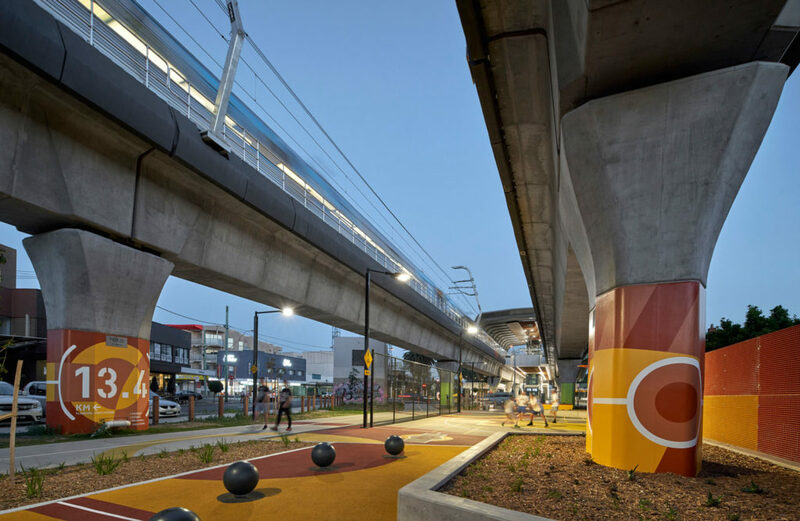 The linear park is a highlight, featuring a number of local and community ‘activation nodes’. Ranging from small areas for local gatherings, with fitness stations, seating and planting, to playgrounds, picnic areas, dog parks and larger community areas for activities such as sport, skating, bouldering and climbing, these nodes provide attractive, safe and well-maintained places for the community to enjoy. 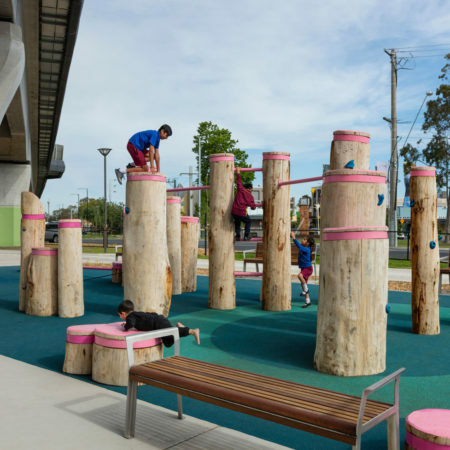 Many of the materials where repurposed materials from the removed trees, demolished rail lines and railway stations and were transformed into seats, play items and landscape features. 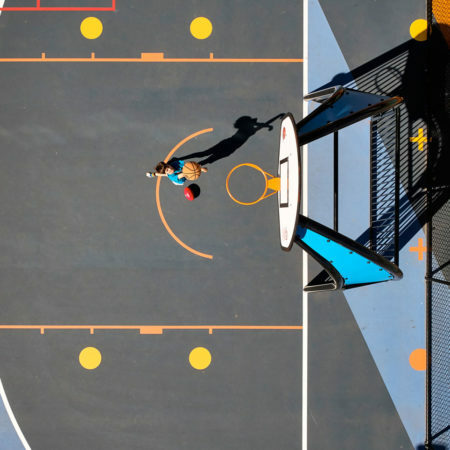 Facilities and programs in the parks were carefully developed to compliment the more traditional sport and recreation facilities that were provided in the suburbs. 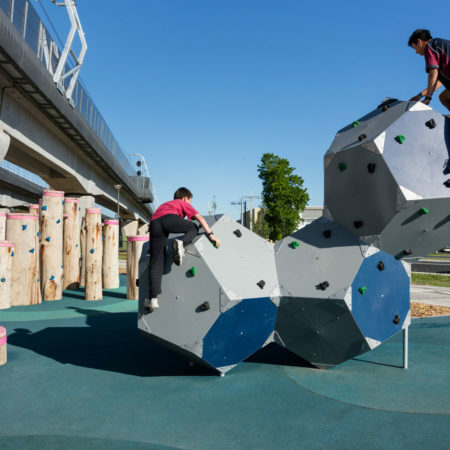 The idea around multi-generational spaces were embraced by the Councils and the community, as a way of bringing social and age groups together for both more social interaction and improved community safety. 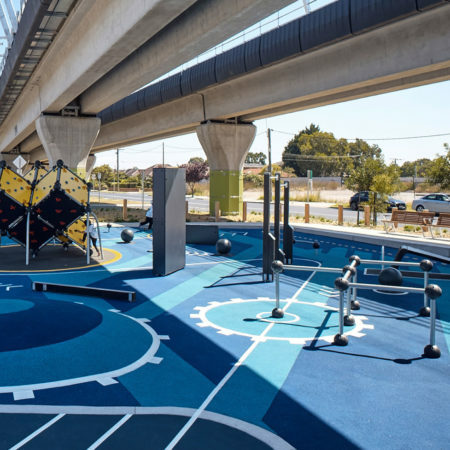 For example, the activity node in Carnegie, contains fitness equipment, sport courts, picnic facilities, ping pong and a bike repair station. 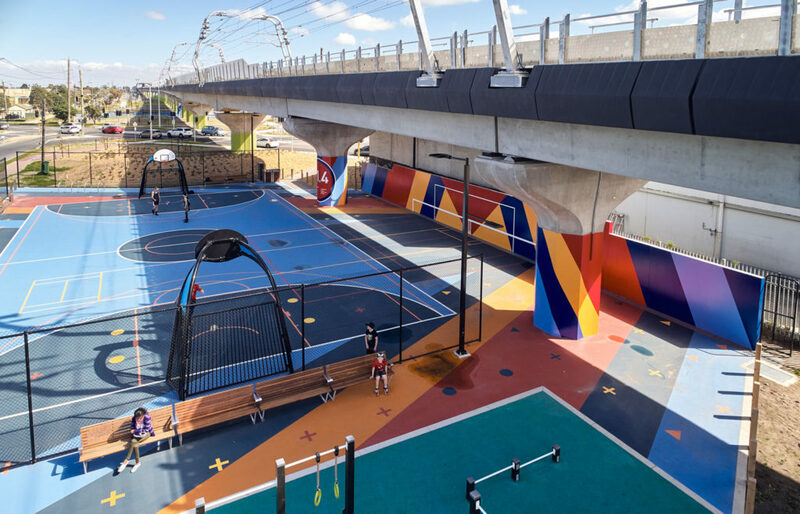 The space is used by grandparents playing ping pong with their grandchildren, while young adults play basketball and some elderly people sit and enjoy the communal table. 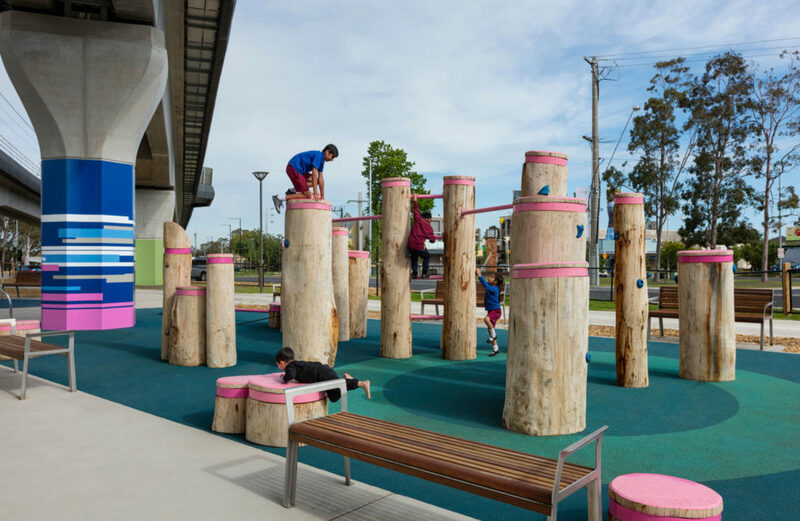 The super graphical approach to many of the activation nodes, was a response to creating more immediate placemaking opportunities, while the larger new urban parkland and planting matures. 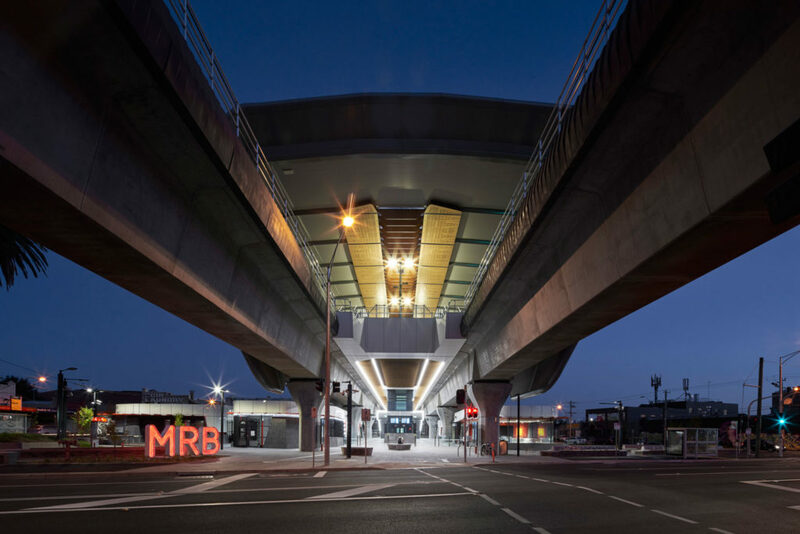 The activation nodes took advantage of the space beneath the railway line and worked positively with the piers, the room and strong perspective qualities. 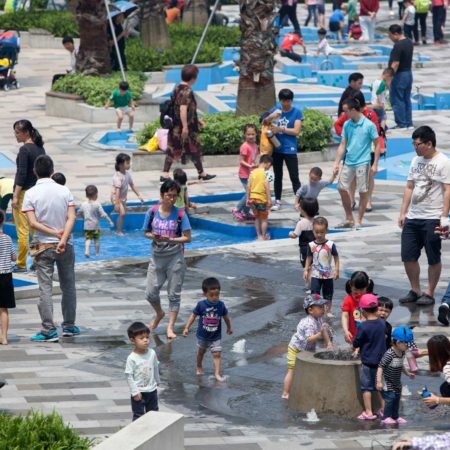 As soil, water and tree planting was limited in these areas, utilising them for hard surface recreation was logical. 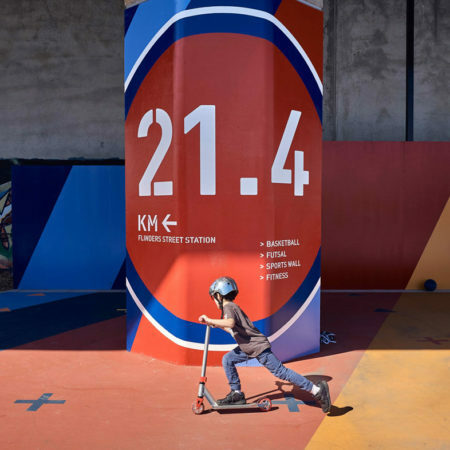 Their physical and graphical design plays on local culture or recreational themes. 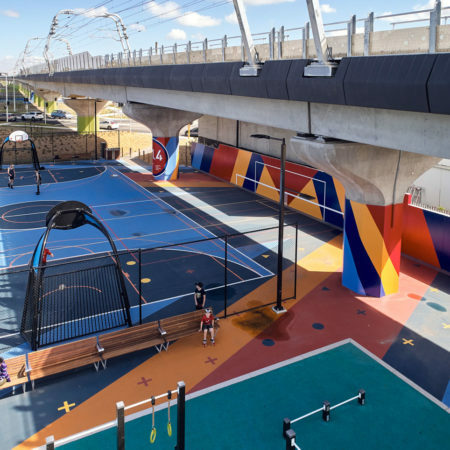 For example, the activation node at Ross Park, draws on the history of rock and roll / music competitions in the suburb and the need to balance out the more male focused space and the dominant council brand colours of green and blue throughout the precinct. 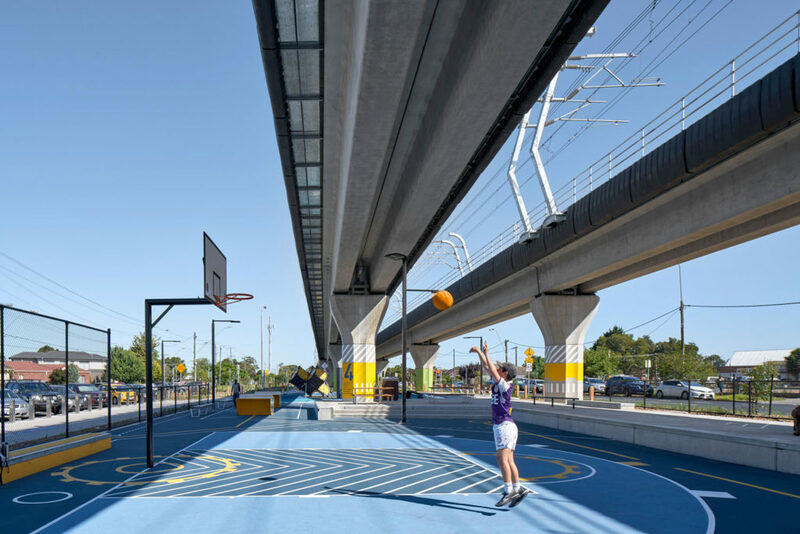 The eastern Centre Road node draws on the strong perspective created by the elevated rail to create a large-scale virtual games type space. 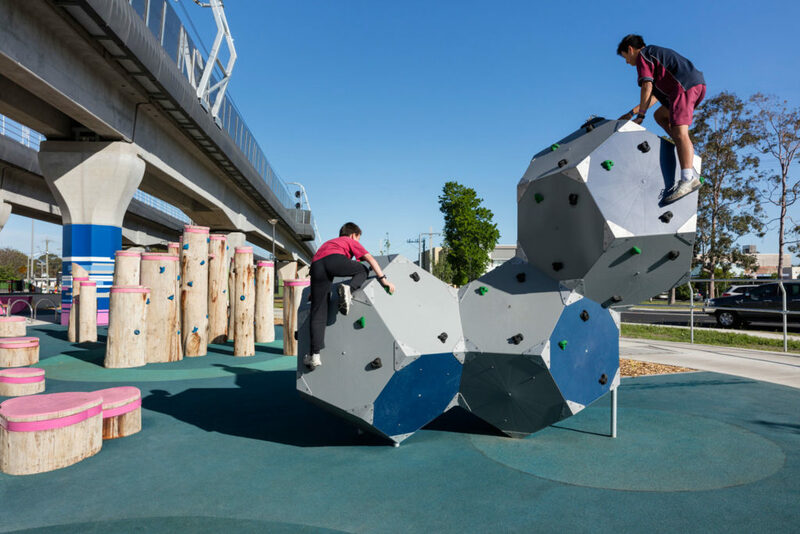 Encouraging use and occupation of the space creates the added benefit of bringing many sets of eyes to the corridor, elevating feelings of safety, discouraging anti-social activity and in turn encouraging further use. 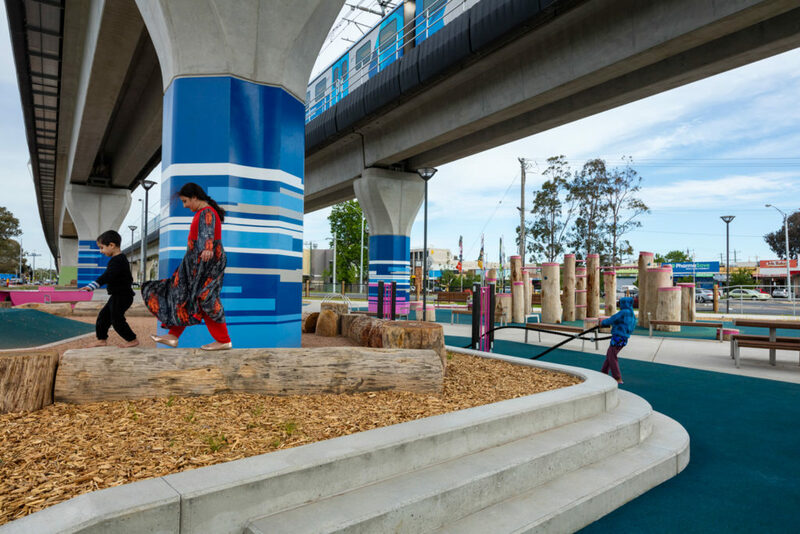 The bold use of colour within these areas was a deliberate move to provide vibrant, engaging public spaces at day one prior to the establishment of surrounding vegetation. 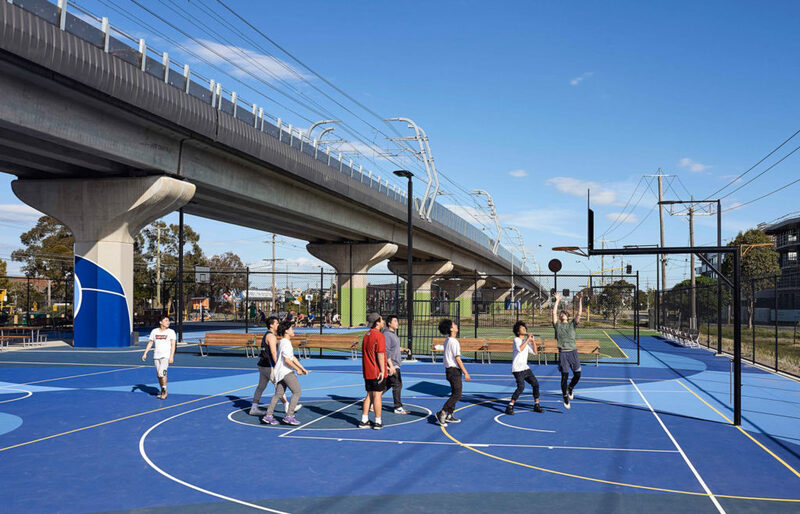 The project was a cultural and mindset shift to deliver a generational city-shaping outcome. 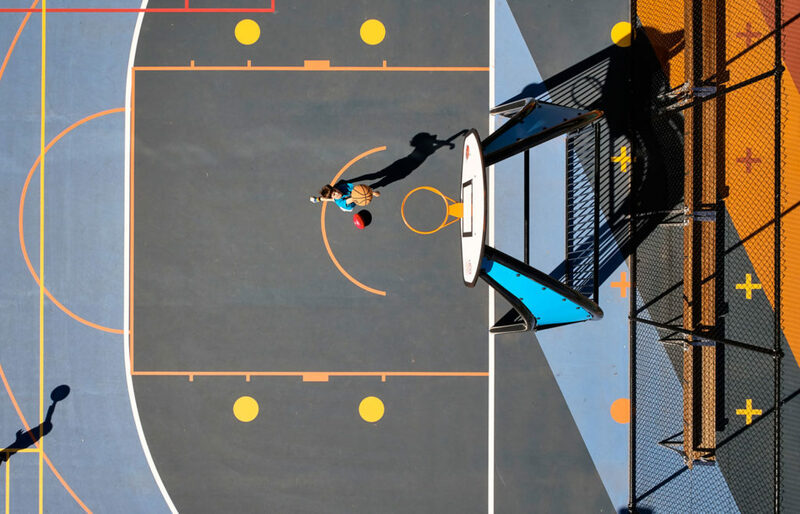 The team did not shy away from the controversy but rather embraced it as an opportunity for open dialog and exploration to imagine the transformative possibilities of place. 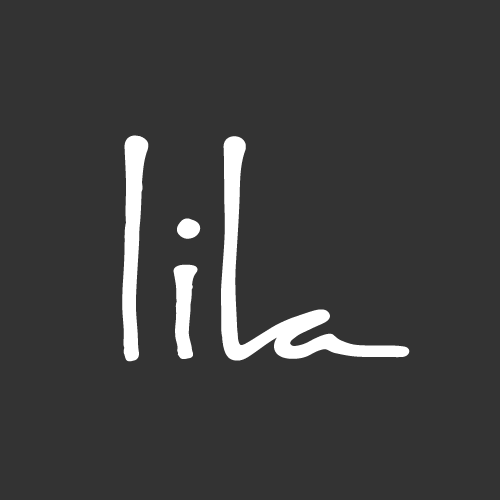 The honesty and realism in the approach brought humanity to the project. Though the true success of such a project can only be measured in time. 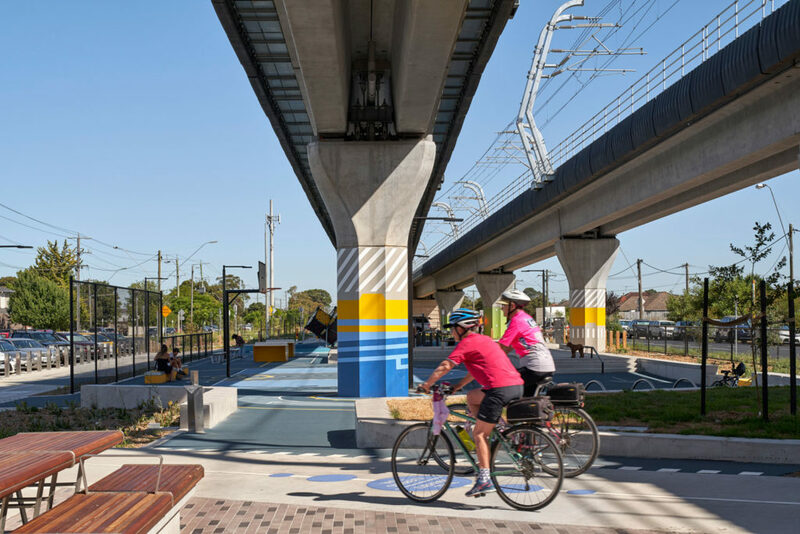 The integrated design and teamwork led to an end-product that is so much more than a public space, public transport or an infrastructure project. 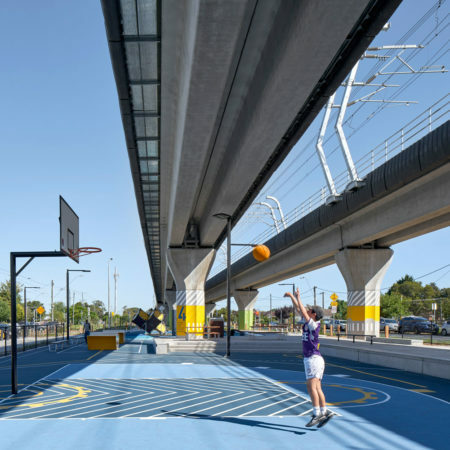 The project encouraged an evolution from spatially linear and dominating infrastructure to an enhanced, integrated, connected network of social, green and transport infrastructure. 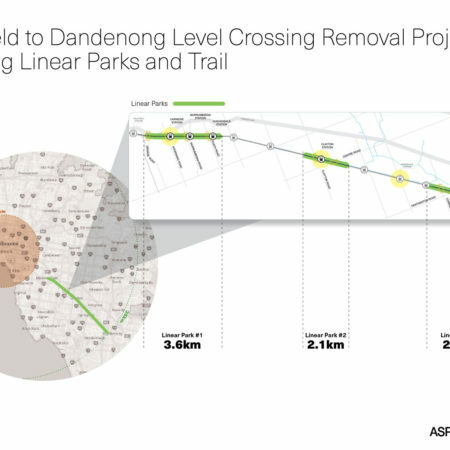 The Caulfield to Dandenong Level Crossing Removal Project is an urban revitalisation project that will benefit the community through a generational legacy. 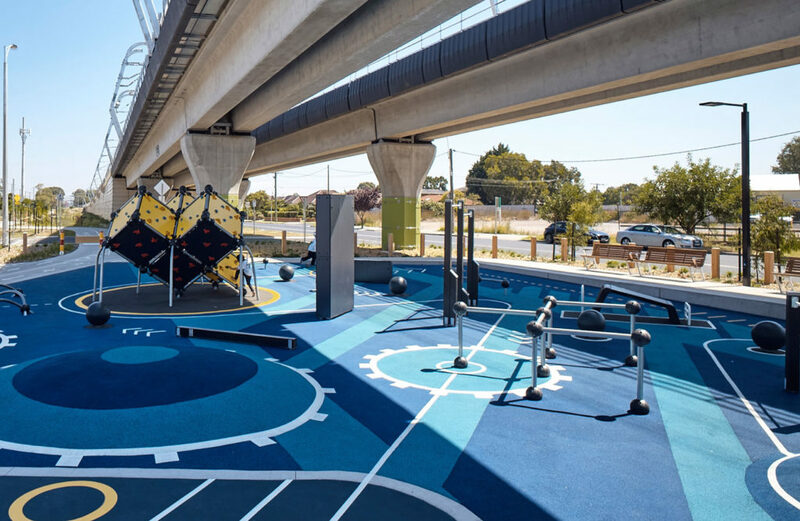 Whilst less tangible, the flow-on effects that increased physical activity and social interaction have upon the physical and mental health upon the community are well documented, and it is here that the project may well leave its greatest legacy. 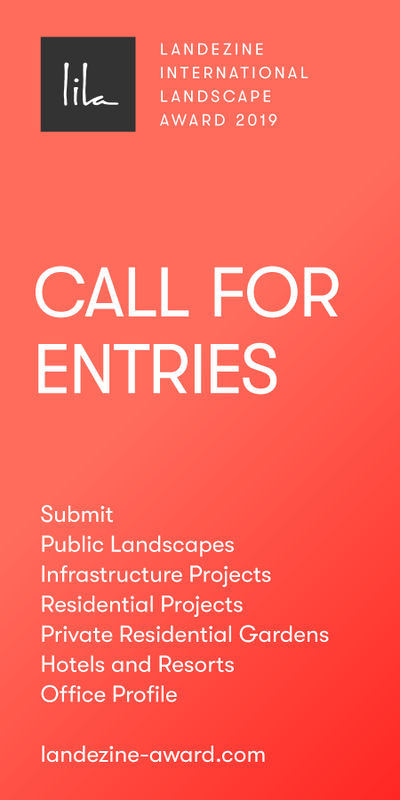 Whether it be walking or cycling along a green and leafy corridor, cycling to the station before catching the train to work, playing sport with friends, or simply having a chance encounter with old or new friends, elevating the tracks enabled the project to establish the social and physical infrastructure that will improve the holistic health of all whom engage with it. 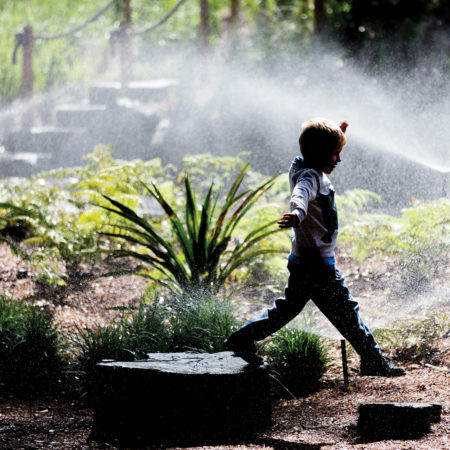 • Integrated water management throughout linear parks. 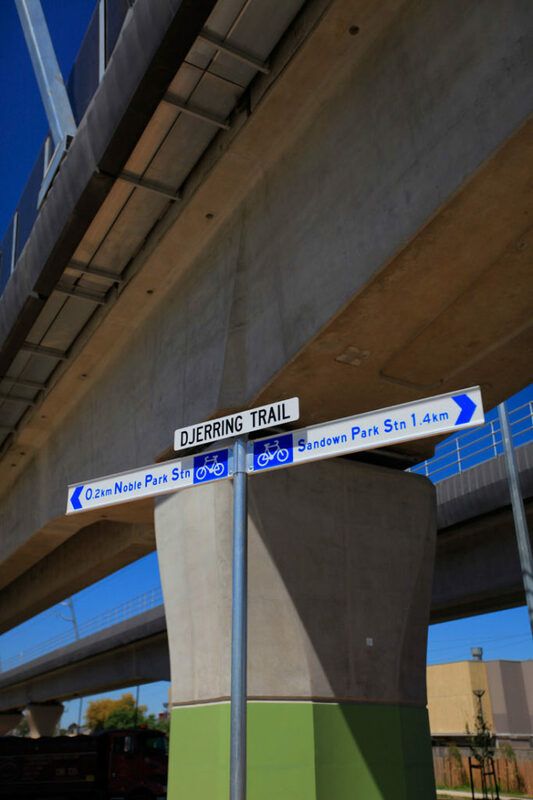 • The project built 12 kilometres of new path linking several sections of existing path, to create a new 17-km long trail named The Djerring Trail. 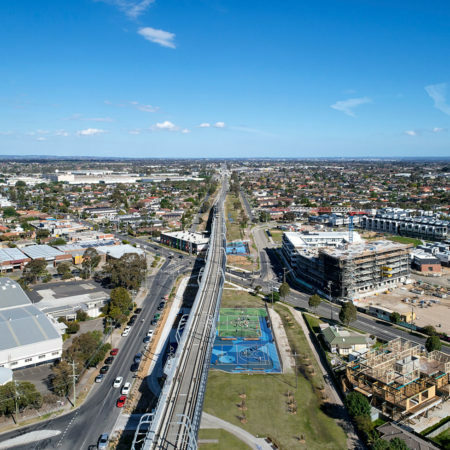 Project location: Suburbs of Carnegie, Noble Park, Hughesdale, Murrumbeena and Clayton in Melbourne, Victoria, Australia.